Here again I speak of a favorite author just lately mentioned, readers. G. K. Chesterton’s Ballad of the White Horse was recommended to me a long time ago, but only recently did I download a copy of the Ballad to read it. I enjoyed it immensely but found that my Gutenberg.org edition lacked footnotes to clarify some of Chesterton’s poetry. So I hunted up a hard copy of the book (I usually prefer hardcopies of books or papers anyway) and bought it, determined to better understand what I found to be such joyful reading. The Ballad of the White Horse, by G. K. Chesterton, tells the story of King Alfred’s battle against the Danes who had invaded England. Alfred was a king dispossessed and in hiding; should the Danes find him, England’s only hope of driving the enemy from her soil would vanish. It is unimportant how historically accurate The Ballad is to both the author and to me; suffice it to say that Alfred was a king of England and he did drive the Danes from his kingdom – quite heroically, too. Chesterton shows us Alfred hiding from the Danes on the island of Athelney, feeling despair creep over him. His people are scattered or under the yoke of the Danes, his armies destroyed, and his remaining chieftains hold their own territory free of the Danes – but that is all they can do. His situation is looking grimmer by the day. Then he sees a vision of the Virgin Mary who tells him, “I tell you naught for your comfort/Yea, naught for your desire/Save that the sky grows darker yet/ And the sea rises higher.” Mary adds to her warning: “Do you have faith without a cause/ Yea, faith without a hope?” In other words, Alfred is not told whether he will fail or win, only that he must try to defeat the Danes. Thus inspired, Alfred heads out to find and rally his chieftains: Mark the Roman, Eldred the Franklin, and Colan the Gael. I myself have Irish lineage, though I will say no more of that. But I will take this verse – and others in The Ballad – as compliments high and fair to that race of which I claim a small part. The final battle against the Danes goes hard; all three chieftains are lost but Alfred does gain the day, and becomes king of England once again. I would recommend to anyone who desires to read the poem to buy a book with footnotes – reliable footnotes – so that they can better understand the Ballad. Apart from Tolkien’s Lord of the Rings, the Ballad is one of the few works of fiction I will not part with. A last word, readers. The white horse geoglyph, which does exist and lies carved into a mound in England, is mentioned throughout the Ballad as a recurring theme for the story. During the course of the Ballad, the white horse is used to suggest the transcendent. As Alfred points out to the king of the invading Danes, Guthrum, destruction is not as wonderful as the Danes make it out to be. Things naturally rot away or crumble back into the earth. Even the White Horse geoglyph disappears under weeds and thorns every year. And it would stay there, lost to history, if it were not scoured annually. Therefore, which is the greater power? he asks. Destruction or preservation? The answer is pretty obvious; with decay a part of nature, the fact that anything can be preserved through millennia is astounding. “Will ye part with the weeds for ever? So, readers, if we would have the good of old, the good we know and love today, in order to keep it tomorrow and into ever after – “If we would have the horse of old” – then we must “scour the White Horse anew.” Time after weary time, battle after exhausting battle, we must fight the “Long Defeat” as Tolkien named it, if we wish to see the victory. This entry was posted in Book Reviews and tagged Book Reviews, Danes, England, G. K. Chesterton, J.R.R. 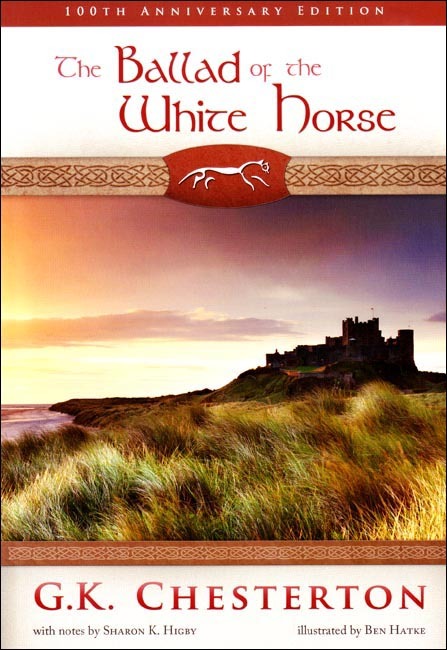 Tolkien, King Alfred of England, The Ballad of the White Horse, the long defeat, Vikings on June 19, 2015 by The Mithril Guardian.